I’ve always been a bit skeptical about the combination of sweets and bacon. I’ve seen chocolate covered bacon, chocolate bacon candy bars, maple bacon ice cream, and most recently, a bacon ice cream sunday from Burger King. I am not really sure where this revulsion came from. Bacon dipped in syrup is one of my favorites, after all. Bacon, something we don’t usually keep on hand, has been kept in abundance lately. This might have something to do with the fact that we’ve had a lot of visitors, or it might just have something to do with the fact that bacon is delicious. There’s no denying that. Having always been interested in savory cupcakes, but never daring enough to try my own, I decided it was time to give it whirl. To my surprise, the combination of bacon with chocolate suddenly sounded quite delicious. So, I got to searching. Melding bits and pieces from different recipes, I came up with this sweet and salty treat that was destined to be a crowd-pleaser. Fill your house with the smokey smell and crackling pops of bacon. Meanwhile, preheat your oven to 375 degrees. After your bacon becomes crisp and lightly browned, drain, crumble, and set aside. Reserve one piece for garnish. In a large bowl, stir together the flour, cocoa powder, sugar, baking soda, baking powder and salt. Pour the egg, coffee, milk and oil into your dry mixture. Stir just until blended, then mix in 3/4 of your bacon. 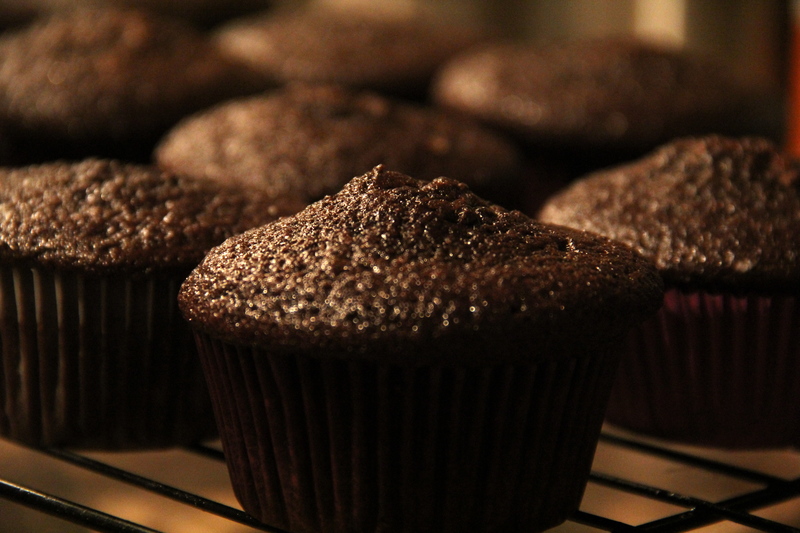 Spoon the batter into lined a cupcake pan, dividing evenly. Bake for 20 minutes, or until an inserted toothpick comes out clean. Once they are finished baking, let cool on a wire rack. Place butter in a bowl and beat until creamy. Add sugar and cocoa; mixing well. Add milk in portions, stirring each time, then add vanilla. Add your frosting, garnish with bacon, and enjoy! 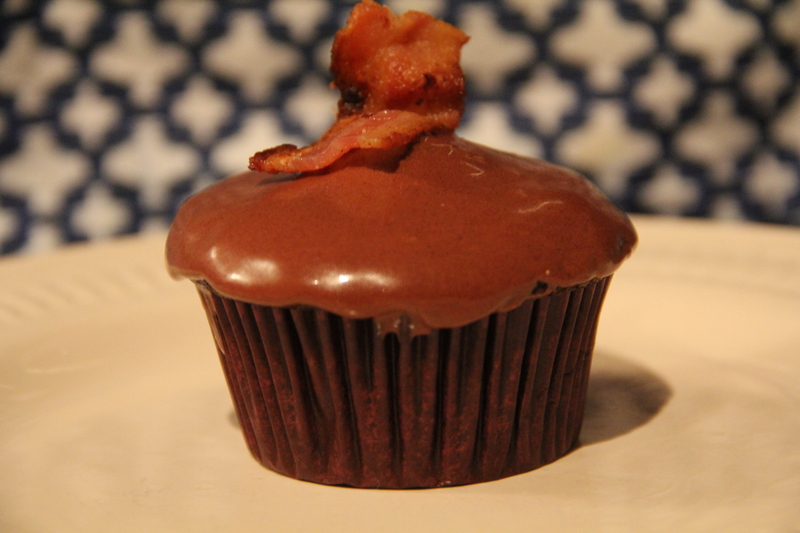 The smokey, salty, and subtle flavor of the bacon pairs perfectly with the richness of the chocolate cake. I think that the two were meant for one another.